Imbolc | Paranormal Forum: " Where paranormal, science, and spirit meet"
Discussion in 'Spirituality / MetaPhysics / OBE / NDE' started by Debi, Feb 1, 2019. 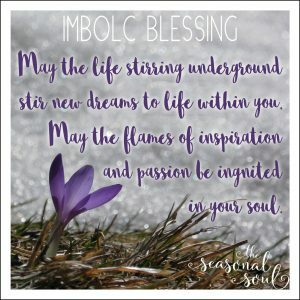 What is the Spiritual Meaning of Imbolc? This week we reach the midpoint of winter, marked by the cross-quarter day of Imbolc. Traditionally, Imbolc begins at sundown on February 1st & continues through February 2nd. Imbolc is an ancient Gaelic holiday celebrating the very first stirrings of new life–the earliest breaths of spring. Even though there may still be snow on the ground where you are, even if it’s freezing cold outside, we are beginning to feel the very earliest hints of spring rising in our spirits. After months of turning inward, of hibernation & of rest, life is beginning to stir again. Depending on where you are, you may be seeing the first spring flowers beginning to show signs of life. Here in Seattle I’ve been spying crocuses & daffodils rising up through the earth. Spiritually, this is a time of new life coming into manifestation. We may only be seeing the tiniest hints of life above the surface but things are really beginning to stir in the darkness. Just like nature is beginning to awaken after its dormant period, we are also reawakening with new dreams & exciting new plans. This time of year our spirits are beginning to strrrrrretch & to shake off the doldrums of winter. And with this awakening comes a much needed cleansing. When those new flowers begin to poke their heads up through the dirt, it stirs a desire to clear the ground of dead growth. I definitely feel like I need to get outside & rake up the wet, dirty old leaves I never got to in autumn; there’s a few perennials I never cut back. I need to get outside now & clear those things away before new growth starts sprouting amongst the dead, twisted old branches. Imbolc brings this final cleansing for our spirits as well. This is the time to clear out the dirty old clutter, and the things that died within us during winter, in order to prepare for the exciting new growth to come. These last few months of turning inward & descending into darkness, were all about identifying the things within us that we’re ready to let go of; those twisted old branches & dead leaves that we’re finally ready to clear away. This is the time to really let those things go once and for all. Often that means Imbolc is a time of real transition & change. This is a time of leaving what is safe & comfortable in order to grow more fully into yourself. We talk about growth & change & letting go of the things that no longer serve us with anticipation & excitement. But the reality is, change is really frickin’ hard. We are creatures of habit. We like things that are familiar & comfortable. But, real change requires us to let go of all that. We have to set aside what we know & step into a new way of being. And that can be really uncomfortable. Because this is also the time when your winter dreams are beginning to stir with new life. These last couple months you’ve been dreaming up new visions, plans & ideas for your life in the year ahead. These dreams are hopeful & exciting, and they’ve lit the fires of creativity & inspiration within you. This fire will give you the strength to walk through this challenging time of being tested by change. Like the groundhog that makes headlines this time of year, we’re also beginning to poke our heads out from our own inner worlds. This is the time to begin to bring your own inner work, those dreams & changes you’ve been dreaming about, out into the world. Below are a few journal prompts to help you tap into the energy of Imbolc & reflect on what’s happening spiritually at this time of year. And click here for 2 lovely rituals/ceremonies to help you honor this sacred seasonal day & tap into its transformational power. Brightest Imbolc blessings to you, my friends! I hope this all your winter dreams come to life & this new year takes you to exciting, powerful places. Sending you so much love on your journey. 1. While you’ve been cooped up over the winter, what has been growing & stirring within you? 2. What tiny buds of new life are beginning to appear from those winter dreams? What new beginning are you experiencing? 3. What are the projects & plans you’d like to bring to life over the next few months? 4. Are there changes currently taking place in your life, or transitions you are experiencing that are making you feel out of balance or uncomfortable? SierraRocks, garnetsilver, WitchAndShaman and 2 others like this. garnetsilver, Lynne, WitchAndShaman and 2 others like this. Time to clean my closet !